Hot Cross Buns are everywhere in the shops just now, even though it is nearly a month until Easter. This is an easy warming dessert made with these spiced and fruited bread buns and if you have children or teenagers to feed, it fills them up! 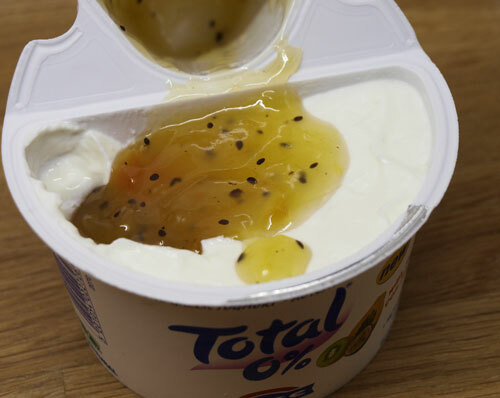 It also features one of the Total 0% Yogurt Split Pots, this time it's the one with the honey. Grease a small deep heatproof dish with a little of the butter. Split the bun and spread each half with the remaining butter. Slice the bun into small squares and place in the dish. Drizzle over the honey. Beat the eggs, sugar, milk and yogurt together and pour over the pieces of bun. Leave for an hour to soak, then pre-heat the oven to 170C and bake in the oven for about 30 minutes until risen and golden. I served this with icecream, but you could eat it as it is, with custard, cream or more yogurt. I don't know about you, but I need to lose a few pounds after the long, cold dark winter. 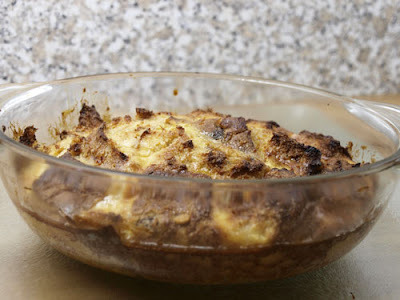 I've been tempted by warming puds which are now all around my hips! But wait....what's this? Those lovely people at Total have created the perfect answer, providing a hit of creaminess with a shot of sweetness, it's the Total 0% greek yogurt split pot! What do you get? 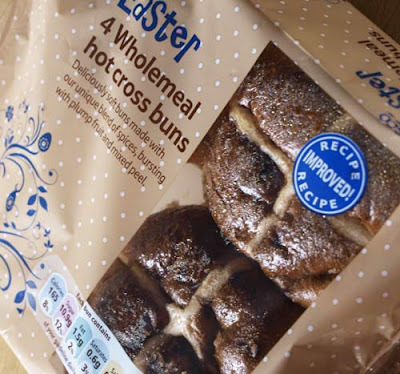 Well they are only around 85 kcal per pot and 0% fat, so you can certainly indulge in one of these for breakfast or a snack or even for dessert! They come with honey, strawberry, tropical fruit or blueberry. 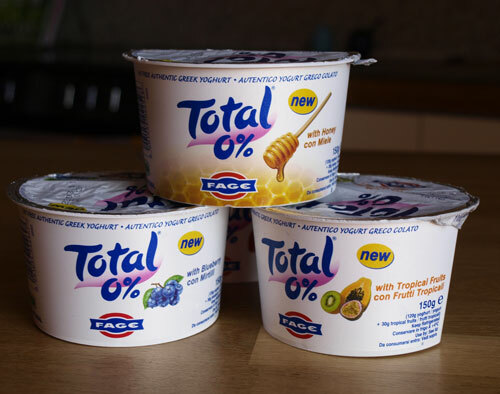 Now although these Total Greek Yogurt Split Pots are delicious just as they are, I couldn't resist the urge to 'mess around' with them. This weekend I seemed to have a lot of little clememtines in the fruit bowl, so decided to make a fruit salad. I genlty poached the clementine segments in orange juice and a teaspoon of caster sugar for about 10 minutes. Then once it had cooled added the chopped apple and banana. 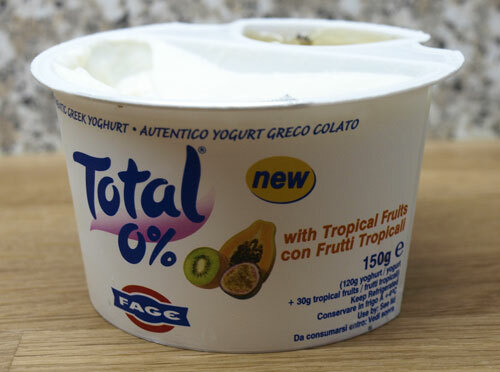 I then took two Total 0% Greek Yogurt Split Pots with Tropical Fruits. I put all the 0% yogurt into a bowl and mixed through all the fruit from one of the split pots and half of the fruit from the other. I topped the fruit salad with the Tropical Fruit Yogurt and put a teaspoonful of the reserved Tropical Fruit Sauce on the top of each one. 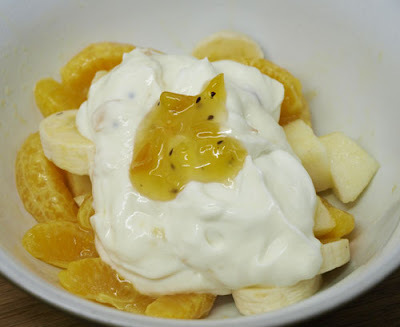 The creamy yogurt cut through the acidity of the organges, delicious and refreshing. I've had visitors for the past two weekends, I don't often have people to stay and rarely two weekends in a row, but my son and DIL just had a gorgeous little boy, and as they live right next door, my relatives have stayed at my house. I made the gingerbread and some Peanut Butter and Chocolate Chip Cookies last weekend. I had to hide the gingerbread to stop my husband, Brian, from eating it! I also stashed some cookies so there were still plenty for the second wave of visitors. You learn a few things by the time you become a grandmother, especially when you have had two sons! 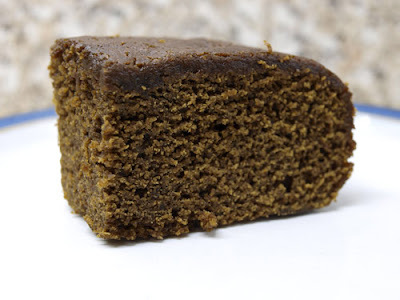 Gingerbread is always better when it has been 'matured' anyway and this one was moist, gingery and nicely sticky. The recipe comes from the Good Housekeeping Complete Book of Home Baking. 1. Grease a deep 18cm (7 in) square cake tin. Line with greaseproof paper and then grease the paper. 2. 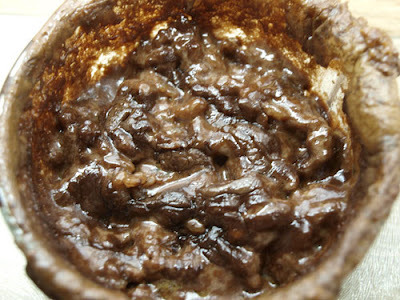 Put the black treacle, golden syrup, butter and lard into a saucepan and heat gently until melted. 3. Sift the flour, bicarbonate of soda and spices into a bowl and stir in the sugar. 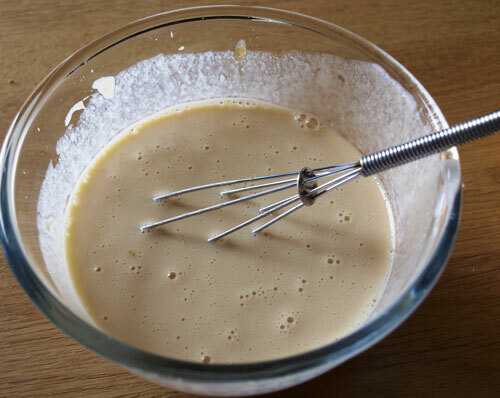 Make a well in the centre and pour in the milk and treacle mixture. Beat well until smooth and of a thick pouring consistency. 4. Pour into the prepared tin and bake in the oven at 170c (325F) mark 3 for 1 - 1 1/4 hours or until a fine warmed skewer inserted in the centre of the cake comes out clean. Cool in the tin for 1 hour then turn out and cool completely on a wire rack. 5. Wrap in greaseproof paper and foil and store in an airtight tin for 2 days before eating. I entered the draw for a box of Valentine's Cupcakes from Queen of Cupcakes over at Pig Pig's Corner and I WON!!!!! Looking forward to receiving these, they look divine. I'll show you properly when they arrive. It's time for another Forever Nigella challenge over at maisoncupcake.com. Now Nigella has many delicious chocolate creations in her cook books, but I didn't want to make a big cake or a pile of cookies because you know what would have happened...yes, I would have eaten them all. So I thought I'd see if I could find something that could be made on a fairly small scale, maybe a dessert that could be shared but not sitting there tempting me all week! 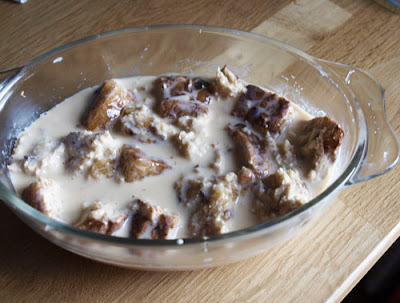 This recipe is in Nigella's Feast book but as I made some alterations by using double cream (it needed used up) and the white chocolate which was also left over from another recipe, so I can post the amended recipe. Preheat the oven to gas mark 2/150c. Put the baking sheet in the oven to warm as it heats. 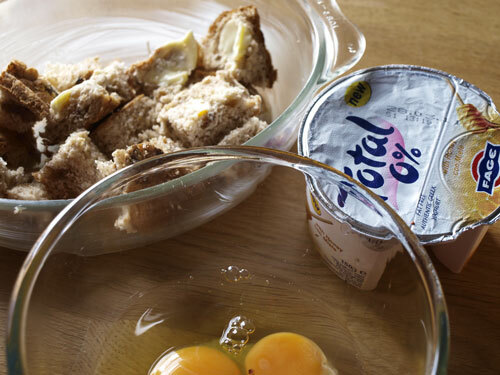 Grease two 150ml pudding bowls or ramekins. 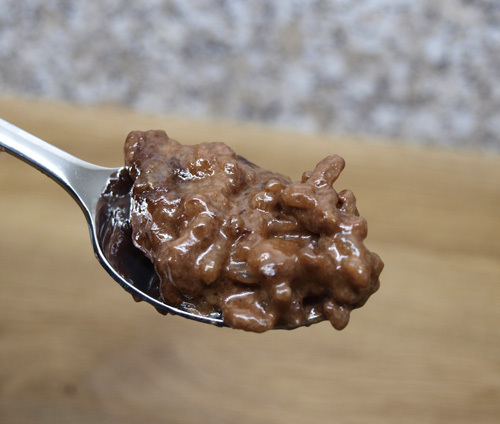 Put the cocoa into a small measuring jug and dissolve with the boiling water then pour in the milk, stirring. Divide between the buttered dishes. Add 1 tablespoon of rice and divide the tablespoon of sugar between the dishes, stir. Add the chopped chocolate and put them on the baking tray in the oven for 30-40 minutes. Let stand for a while before serving. It doesn't look particularly pretty when it comes out of the oven but it is really delicious, and not oversweet even with the white choc included. Do you want to see? Really? It might put you off! Okay you asked for it...not a pretty sight, lol!